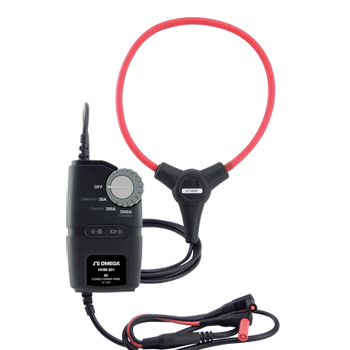 The HHM301 allows any clamp meter or multimeter to enclose a thick or hard-to-reach conductor, bundle of conductors, or bus bar while increasing its AC current measurement range to up to 3000 Aac. The product has three components: a flexible probe, a current-tovoltage converter, and a pair of banana plug output leads. When formed into a loop, the probe is called a Rogowski coil which is a helical coil of wire inside a shield that is designed to be placed around a straight conductor, a bundle of conductors, or a copper bus bar that typically carries large currents (>10A). The voltage induced in a Rogowski coil is proportional to the rate of change (derivative) of current in the straight conductor. In the HHM301, the integrator circuit needed to change the output of the Rogowski coil to a voltage signal proportional to current is located inside the current-to-voltage converter. The converter allows you to choose the HHM301 full-scale current range and therefore its current-tovoltage conversion factor. The rotary switch on the converter has three positions: 30A, 300A and 3000A. With the switch in the 30A position, the unit converts current to voltage at a ratio of 100 mVac/A and outputs the result to the banana plug output leads. The leads are designed to be plugged into a multimeter or clamp meter operating in AC voltage measurement mode. A simple formula can then be used to convert the meter’s voltage reading back to a current measurement. With the converter switch in the 300A position, the conversion factor change to 10 mVac/A; in the 3000A position, the conversion factor is 1 mVac/A. The three ranges allow you to measure very large currents each with a unique combination of range and resolution. Position Error: ±1% @ 1" from conductor; ±2% @ 2"; ±3% @ 3"
Note: The HHM301 (current probe, converter and non-detachable 90° banana plug output leads) comes fully assembled and includes 2 “AAA” batteries and operator’s manual.